This post has been languishing among my drafts for over a month. I keep coming back to it, trying to sweeten it up, and ending up with something more acerbic than what I started with. Just before the new year, Jennifer LaGarde (The Adventures of Library Girl) posted a thoughtful list of questions reflective librarians should consider in their practice this year. If you are looking for a constructive and positive post - something upbeat and hopeful - stop reading this now and read that instead. Not many people will like what follows, I have been trying to fix it, and it only gets worse. I've tried abandoning it, but it lures me back. It's time for me to stop revising and just publish it. But be warned: it is not warm and fuzzy. What follows was inspired by an early-December email from a database vendor asking me to update our school's IP address information. I had just been through an exasperating exchange about how tracking database usage using IP address authentication was useless in a BYOT environment since many students use their personal data plans to access the Internet. 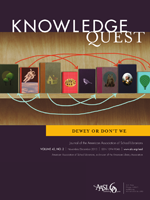 That was followed by a conversation with an eBook distributor who was trying to establish quantitative guidelines for digital v. print books... and then I received my November/December 2013 edition of Knowledge Quest - Dewey or Don't We. That's when I wrote the following list. What we should call ourselves: It's what we DO that counts, not what we call ourselves. The American Association of School Librarians (AASL) changed our title from school librarian to school library media specialist in 1998, then back to school librarian just a decade later, and all it did was cause confusion. The International Society for Technology in Education (ISTE) calls us media specialists. Others call us teacher librarians, but ultimately what we call ourselves is not going to cost or save jobs. If the title "school librarian" conjures images of dispensable school personnel, then someone somewhere must have done something to propagate that notion. But that's water under the bridge. It's up to us to demonstrate that school librarians are transformational educators who favorably impact every learner in every school - changing our title will only muddy our role. IP address authentication for databases (and more): In a mobile learning environment where data plans abound, IP address is about the least reliable mechanism to authenticate users and track usage. Most vendors are willing to provide alternative solutions when librarians ask for them. There are more mobile phones than toothbrushes in the world. Vendors, publishers and educators need to build instruction and infrastructure for mobile learning, rather than hardwired desktop computing. Saving libraries: See David Lankes August 2012 post. Saying that libraries need saving implies that they are endangered. Let's innovate libraries rather than preserve them. Let's grow amazing programs. Let's transform teaching and learning. Let's evolve with our learners. Let's help teachers teach, learners learn, and document the process. If we focus on that in lieu of advocacy, advocacy won't be as necessary. EBook/print book ratio: In the aforementioned conversation with an eContent distributor, I chastised him for trying to devise a formula for an "appropriate" ratio of electronic to print books for school libraries. I explained that the only person qualified to make that calculation is a certified school librarian (or whatever you call them - see "W" above) who knows his/her teaching and learning community's needs. Print v. digital, screen size preference, community demographics, access to mobile technology, Internet access, curriculum, learning standards, student v. teacher selected content (Chris Harris' terms), readers, reading capacity, etc. - this cannot be computed through magical formula that can be applied to a random learning environment. There are variables - human variables that defy calculation. This is one of many reasons why schools need librarians. Ditching Dewey: It won't matter soon. Just do what works for your learning community and stop trying the generate controversy over something that will become immaterial (quite literally) within the next decade. When we focus on physical resource location, rather than resource evaluation, we reinforce all those "keeper of the books" stereotypes. Oh, and yeah... that spells W.I.S.E.D., as in it's time we wised up? Like I said, I've been trying really hard not to publish this, and there was a point right after Jennifer posted her 11 questions piece that I said, "Yes, that's what we need to focus on! ", and I chastised myself for articulating what we shouldn't talk about instead of what we should talk about. The "Yes, and..." here is that there is a point where recursive conversations become regressive, and I worry that if we don't abandon at least some of the conversations I mention here, we will not free ourselves up to focus on the innovative thinking Jennifer prescribes. I want us to focus on that stuff, not this stuff. So let's go out there, ask the right questions, and show them how truly awesome we are. Since I reference Jennifer LaGarde’s work throughout this post, I called her up to run it by her. After I explained why I was calling, she said, “It’s funny that you’re calling about the 11 questions post, because that was a follow-up to an earlier post listing five conversations I don’t want to have any more.” I was embarrassed to have missed the post, but my embarrassment was offset by the validation I felt upon learning that our thinking was so in sync. It turns out that in our short lists of conversations to end, we both included what to call ourselves and how to arrange our collections. I chose to go ahead and post this not in spite of the redundancy, but because of it. We’re all educators, right? We know that if one learner asks a question, there will be at least a few others who are wondering the same thing. The same principle applies here. If Jennifer and I agree that there are a few things we need to let go, then chances are, we are not alone. Here’s to fresh ideas in 2014! Thank you for sharing your thoughts. I greatly admire both Jennifer and you for your frank reflections. They mean a lot to all of us out here in the field. I don't see anything wrong with your thoughts or perceive them as negative. I think it's true that sometimes we spin our wheels on items that ultimately become non-issues as time goes by! What does come through loud and clear in your post is that each of us is charged with being the best steward and facilitator for our unique learning community not following a set a rigid guidelines with a one-size-fits-all mentality! Thanks for sharing... I appreciate it. Not Letting Teachers “Friend” & “Follow” Kids Online? Think Twice! Michelle Luhtala, 2011. Simple theme. Powered by Blogger.